It has been a mixed bag year for Samsung. On one side, the company has been performing very well in their components business, but it’s been a challenging one in smartphones. Samsung ceded the #1 smartphone spot to Apple and the Note7 was a low point. Samsung’s credibility was on the line with their next smartphone, which, based on my first analysis on launch day, was a success. We all know that launch theatrics don’t always translate into a great user experience, but they did have me convinced. 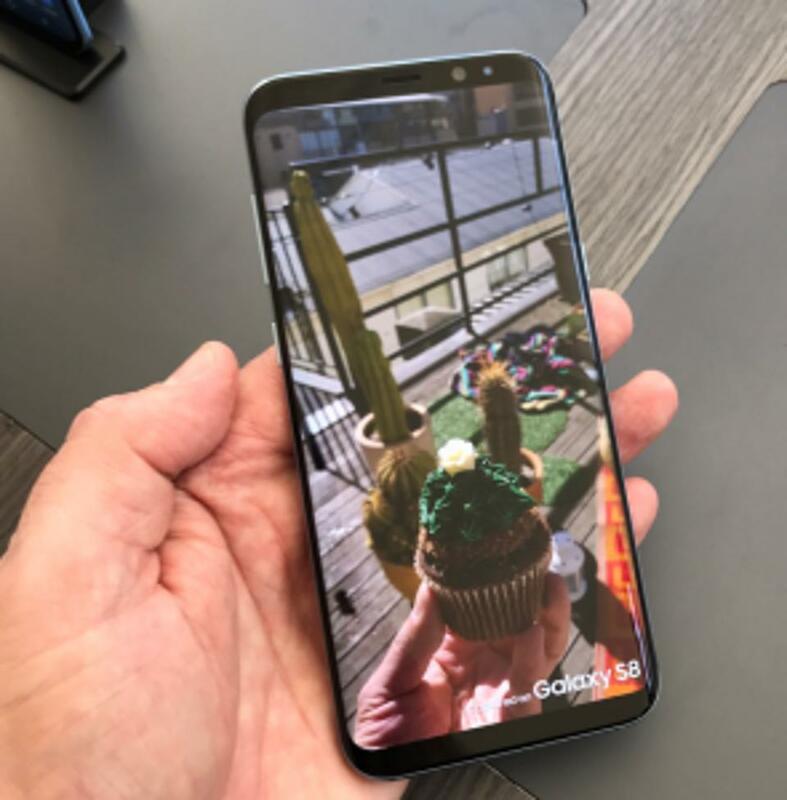 I had the chance to spend a week with the new Samsung Galaxy S8+ and wanted to share some of the highlights of my experience. The Galaxy S8+ is simply beautiful. For decades, we have seen those concept drawings and 3D models of the phone of the future, and the S8+ is so far the closest to that vision of a slab of thin glass. Nearly 85% of the front of the phone is a Quad-HD Super AMOLED Infinity Display. The edges are beveled like an infinity pool, so you really can’t see much of a display edge. The physical home, back and recent keys are gone, too, replaced with programmable, haptic-touch electronic buttons. So, when you do touch the home button, it gives you a physical sensation back. The only way Samsung could have improved on this was to have an ultrasonic fingerprint on the front of the display, but more on that later. Like the Apple iPhone 7 Plus, you will need a case so that it doesn’t slip out of your hands. The Quad-HD Super AMOLED, 529 PPI (pixels per inch) display is gorgeous, extremely bright and very high resolution and capable of HDR, something that the Note7 also had. I may not be much of an audiophile, but when it comes to displays I am picky, I can spot nearly any imperfection, and the S8+ display is as close to perfection as I’ve ever seen. It’s not just me, DisplayMate gave the display its highest rating ever. Pictures, videos and of course apps looked great with very deep blacks and true to life colors. PPI is very important in VR too and the S8+ display was literally the best at it by a mile. Samsung has always had some of the fastest, high resolution smartphone cameras on the market. I didn’t do a deep camera analysis, but I was impressed with how quickly the camera would take its photos and how good they were in low light, helped by an F/1.7 capability. Aside from the Hasselblad Mod on the Moto, the S8+ had the best camera in any Android phone I’ve used compared to the latest and greatest from LG, HTC, Sony and Huawei. I’ll admit, I wish Samsung had added an extra telephoto lens to give it a similar 2X lens like the iPhone 7 Plus. This telephoto lens has become indispensable to me especially when zooming beyond 2x with a blended digital zoom. Samsung extended the low light F/1.7 aperture capability to the front camera and this will help with selfies for sure. Others may argue it’s better to have a selfie flash, but Samsung is accomplishing nearly the same thing with its high aperture. The S8+ uses Qualcomm’s latest Snapdragon 835 processor and its performance and experience shows. As I predicted at the 835 launch, it smokes pretty much any Android phone processor on the planet from Huawei (Hi-Silicon), MediaTek and Xiaomi. The S8+ was very responsive and handled any game and VR experience I could throw at it. I’m looking forward to analyst Anshel Sag doing a deeper dive on VR performance and experience. I did use the Gear 360 and it worked as advertised with the S8+. This stitching was extremely fast. The S8+ is even competitive with the Apple iPhone 7 Plus smartphone with Apple’s A10 Fusion SoC on benchmarks like 3DMark and the multi-core version of GeekBench’s CPU score, but for the most part, on CPU and GPU, iPhone 7 Plus is still the benchmark king. I’m really looking forward to when smartphone benchmarks evolve to where they are better able to test workloads like VR and AI performance. Finally, which could arguably be called the most exciting part of the S8+, the gigabit-class LTE modem, delivers 3-4X the performance of what you likely have today. This “line-speed” capability is incredible and I urge you to read Anshel Sag’s experiences where he had gigabit-class LTE and ran a battery of experiences. Gigabit-class LTE service of course is great for videos and files, but also enables streaming VR, Android instant apps and super-charges use cases like DeX and VDI apps for work. Finally, the S8+ also enable a special kind on Wi-Fi, called MU-MIMO (multi-user MIMO), which clears congestion on your Wi-Fi network and speeds it up for other devices, too. You can read about MU-MIMO here. Oh, I forgot to mention, it also comes with the latest Bluetooth 5.0 as well, the first phone with it in the world and its built right into the Snapdragon 835. The only other wireless technology Samsung could have added was the highest-speed WiFi called 802.11AD or WiGig. Samsung literally killed it with their wireless technologies and I can’t see how any premium phone can be called premium without these wireless features. The S8+ will likely be the most secure stock Android phone with Knox, Secure Folder and iris scanning capabilities but it will take security researchers hammering on it to fully vet the platform as they always do. Ironically, research suggests that most consumers don’t even use a password on their phone. Crazy but true. For them, Samsung added facial recognition, which not as secure as fingerprint,but is easier than reaching for the fingerprint reader on the back of the phone. I wish the reader was lower and in the center of the phone as I found myself accidentally putting finger on the camera lens. I also wish the iris scanner worked further away as I typically have to move my phone closer to my face to unlock. Therefore, I personally used the iris scanner which, according to Samsung, takes 100ms more to read than a fingerprint reader, not a whole lot. Iris scanning also checks more variables than fingerprint, all things equal. I like Secure Folder as I can “stack” different biometric security methods on top of each other to get in. For example, to get into the phone, I can use iris scan and then to get into Secure Folder I can require fingerprint, thus requiring two steps to get the most sensitive data and apps. 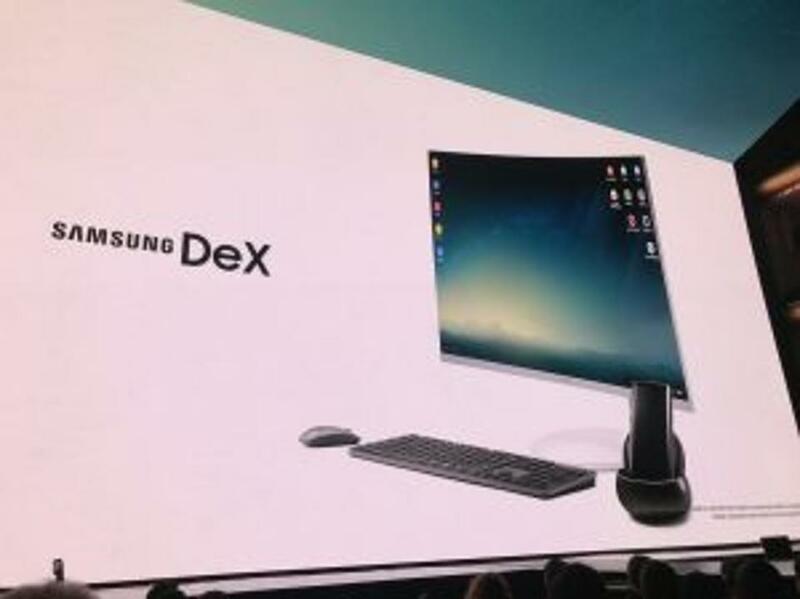 I spent a lot of time testing out DeX which allows users to use their S8+ in a desktop configuration by connecting the smartphone to a dock, keyboard, hard line network, mouse and monitor. I have used many modular technologies over the past decade and I think Samsung has progressed the craft. It’s by no means perfect, but it has brought something very valuable to the game. I cannot wait to see how this progresses over time. I used a Bluetooth keyboard and mouse, plugged in an RJ-45 jack for Gigabit Ethernet, an HDMI cable into a 32″ 4K display, and carefully aligned the phone into the DeX dock. There are no guide rails so you must make sure it actually gets plugged in correctly. Almost immediately, the display pops on and you are looking at what looks like a PC desktop. There’s a fan in the dock for cooling but I never heard it, but this is a good decision to prevent overheating from prolonged use and to maintain a quality experience. In productivity mode, I used Samsung’s Mail, Browser and Calendar in varying-sized windows. I also used Microsoft Office 365 Android apps like Word, PowerPoint, Excel, and OneNote and was very impressed with how much I could get done. Every Android app worked, too, and the ones that weren’t DeX optimized worked in a smaller window. The notifications were done very well, too, and as a heavy-duty PC user looking for sharp differences, I was very impressed. I also signed up for an Amazon Workspace account and ran virtual Windows, Office 365 and ran my entire Windows desktop functionality from the cloud. The only downsides I had with Amazon Workspaces was the lack of Windows 10 option and the most challenging management console experience I’ve ever used. I am not the typical person coming to setup virtual desktops, it’s IT, and they will likely be just fine. Once I did get everything working the experience was good, really good, and I sometimes forgot I was using a virtual machine running Windows and Office 365. One of the things I most appreciated was the sheer amount of Android apps that worked well that didn’t look like a kludge. The windowing was scary good, almost like non-DeX optimized apps were optimized. If you were wondering about performance, I ran benchmarks in DeX and just the S8+ and the DeX were just as good and sometimes better. I’d love to see someone do a super-DeX dock that actually chills the phone to deliver even greater performance. Perhaps that can be accomplished with a slight firmware tweak of the current DeX dock. DeX moved the modular craft down the court in many ways and I can’t wait to see how Samsung accentuates the experience going forward. I’ll be writing more on DeX the more I use it and as it changes and improves. Developers should strongly consider jumping on this train now because it appears to be going somewhere. I’d be remiss without talking about the broad experience ecosystem Samsung has for the Galaxy S8+. Samsung fills in the Galaxy experience with the Gear 360 VR camera, Gear VR glasses with controller, DeX and of course the Samsung Gear smartwatches. These add black and white functionality adders you can’t even do on other phones and they really do matter as they’re extending the S8+ experience in very novel ways. Analyst Anshel Sag did a first impressions review on the Gear 360 here and will be following up in detail on Gear VR with controller. Hey, there’s only so much time in the day, am I right? I couldn’t test everything in a few days and ran out of time to do some in-depth tests on Bixby on Samsung Connect. I feel like these have a bit more work to go, and I don’t think people are making buying decisions on these features, so I’ll hit these later. I also didn’t do extensive battery life tests, but anecdotally, I was very pleased as I feel I could get much more time out of the phone than anything else I use. I really appreciate Samsung’s deep sleep mode than can extend phone use by 24 hours. It’s getting better every iteration and is even color now. I didn’t test IP68 either, but I did submerge the S8+ in my pool and it worked just fine. Samsung had to bring out a winner with the Galaxy S8+ and they did. Aside from Moto with its Mods, I don’t see any other premium Android phone in its league. As for Apple? Well, we’ll have to see what they bring next. I don’t think they will bring VR or AR to the table this iteration. To remain as competitive as they are today, I believe they will need an edge to edge display and maybe even gigabit-LTE. An ultrasonic fingerprint reader on the front of the iPhone would be gravy on top. For right now, it’s Samsung’s Galaxy S8+ day in the sun.